Symetrix SymNet 8x8 DSP units handle input and output routing, as well as signal conditioning, for all audio paths for Schoolcraft College’s Health Professions Simulation Lab in its Biomedical Technology Center. LIVONIA, MI—In cooperation with nearby Botsford Hospital and Garden City Hospital, Schoolcraft College recently completed construction on a Health Professions Simulation Lab (HPSL) in its Biomedical Technology Center. 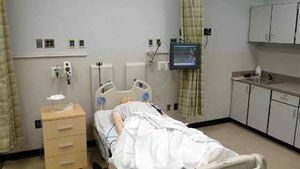 Using sophisticated medical mannequins and hospital-grade equipment, all rooms are flexible enough to present common and rare situations to which health care professionals must be trained to respond appropriately. A comprehensive monitoring and recording system allows students, with the help of instructors, to review and improve their performances. Integrated Design Solutions of Troy, MI designed the audio and video capture systems, and Sound Engineering of Livonia installed it. “It’s really a sight to behold,” said Barry Gilbert, sales engineer for Sound Engineering. “The B-Line medical mannequins simulate blinking and breathing. Their pupils dilate appropriately in response to different stimuli under different medical scenarios. But that’s only the beginning. The mannequins, the equipment, several video cameras, and several microphones all send signal to a B-Line SimCapture device, which records the session and facilitates its playback during debriefing.” In addition to usage by Schoolcraft’s students, the new HPSL facility will be used by the school’s clinical partners at area medical institutions. Each of the four rooms contains compact Panasonic video cameras located in strategic locations, which, together with two-way audio from Revolabs wireless microphones, routes through an AMX control device before entering the SimCapture hardware and software. In addition to the four simulation rooms, the new center includes a centralized control room behind two-way glass and two debriefing rooms. The debriefing rooms facilitate simulation playback in an environment that encourages student self-reflection. For the school’s clinical partners, the debriefing rooms even have a simple means to record the debriefing. That ability is a statutory requirement that allows the new facility to be state-certified. Four Symetrix SymNet 8x8 DSP units, one for every simulation room, handle input and output routing, as well as signal conditioning, for all audio paths. Inputs include microphones in the simulation rooms, as well as talkback microphones from the control room. Outputs include the SimCapture system, JBL loudspeakers (powered by Crown amplifiers) within the simulation rooms and control room, and ear sets that can be worn by the instructor or individuals participating in a simulation.